BJ House has written a so very delightful book about a boy and his dog. She illustrates several different aspects as life learning concepts for children – bullying, compassion, physical disabilities (dealing with them and understanding them) and unconditional love, to name a few. Billy Johnson is a normal boy who likes to celebrate birthdays and play with his friends. He has an understanding and caring parents and a dog named Molly. When Molly has her puppies, Maggie, Freckles, Dandy and Pauly who was born with only three legs. This devastates Billy, but he learns a lot about life from this one seemingly awful event. You must read this book to learn how he and Pauly handle the adversity. This heartwarming book is great for everyone. Sharing it with a child, whether your child, your grandchild or a friend, will be the highlight of your day as you watch them read about Billy and Pauly. It provides a great chance to have a conversation about any of the lessons involved with your children. The illustrator, Paul Cash has captured the storyline with his illustrations that are so representative of today – Billy with a Mohawk haircut and his mother in the latest fashions. The illustrations will captivate the youngest reader to the oldest. Author BJ House lives in Texas with her husband, 2 dogs and several horses and cows. She has 2 children and 9 grandchildren. 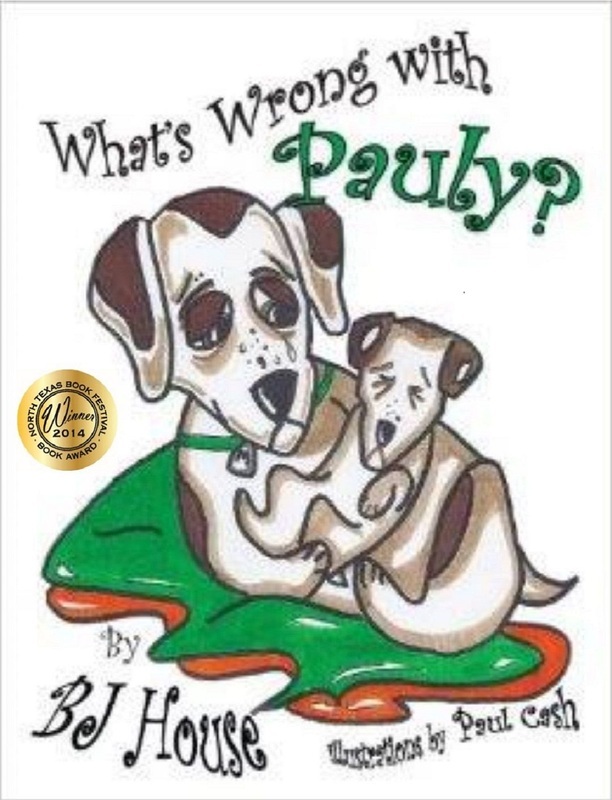 She wrote What’s Wrong with Pauly? for her grandchildren and decided that other children would enjoy it. I am looking forward to more great stories that will come from her fertile imagination.